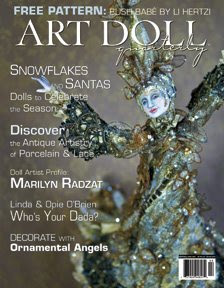 I'm Proud to say the work of my friend and artist extroidinare Marilyn Radzat has been chosen to grace the cover of the recent issue of Art Doll Quarterly with her magnificant Art Doll sculpture & with a wonderful article about her rise to fame and experience in the Art doll world. Marilyn is an icon in the art doll world, and is just as beautiful in spirit as the incredible beauty her fantastical sculptures portray. She Magically, mystically, weaves her spell in apoxie, sea glass, and shards of irridesent glass and antique textiles to create for us spellbinding goddesses filled with inspiration and emotion. I view her pieces with awe filled emotion as if in viewing them in a jewel dripped Cathedral, with heavenly choirs in the background. She Truly is an inspiration in heart and in art. You won't want to miss this article on her! Thank you Marilyn for your friendship and your inspiration! We Have been graciously granted our first Major Award...and, not just any Major Award ..but a Major "French" Award..
Because.....We.. are... Zo very French you know!!... (she says in her very best French accent)!! At least.. Miss "P" zhinks zo)!! Merci Madame Amy for bestowing on us zis most French award!! We are "Easily Amuzed"...no wait..zhats ze wrong country..different Queen...! Firstly, in her very French wig atop her leettle French carriage. And finally, on her Regal French Throne with her crown jewelerys... but off she goes into ze kitchen to eat a tiny slice of French cakes...mmmmnn yummy! She says "She is so hapiez for theze award for Moi"! Merci Merci Amy! Zo now, we must beztow zis French Major Award to some uncommenly commeners as zeese are ze rules...and we most always follow ze rules when zhey fit our agenda.. I award to ze following, as I believe in a past life we must have spent many hours at ze Moulin Rouge soaked in ze other worldy green Fairy world of ze Absynithez..and frolicking in Theatrical Decadenze!! 2...Place a link to ze person from whom you recieved ze award. Merci...Now I'm going to eat cake! Finally! Here she is in all her Ghastly Glory!! as they emerge from the Crypt for a Stroll and a Breath of Fresh Air! Beatrice Baudelair is 9 1/2" tall, Zombie Ted is 2" small (but don't underestimate him) Although, he does have a clean bill of health from the local zombie dentist! They are packing their bags and off to haunt a new mansion! 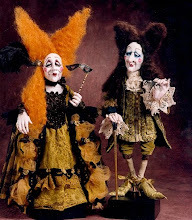 Thank Goodness That Notoriously Baudy & Queen of Gawdy, Miss "P",.. has been happily sidetracked with her new job ... "Queen Bopper of Benevolent Blogs",..just long enough for me to finish Beatrice and get her out of the house! Oh the commotion those two caused!! But, it's never quite for too long, as I fear Miss "P" has something else up her devious & tattered little queenly sleeves...... I'm getting out the charms and the holy water just in case!! You best prepare also! Many thanks to the Hauntingly Hallowed Madame Heather Robertson ! She has created for me this delightfully Dastardly little "Bopped Badge of Dastardly Delight" with the photo of the famous..er.. infamous Miss Pennythistle...Queen of Gawdy Delight..and major Pain in the Patoot! Miss Pennythistle will be making the blog rounds to bestow her seal...so be sure to check your comments to See if she's bopped you!! Thank you again Heather for you delightfully devilish and creepy creative imagination!! Miss "P" The Drama Queen! Well... What can I say...here she lay..every bit the Drama Queen! After expressing her sentiments about how the "Undead" are getting more attention than Moi, Miss Pennythistle keeled over this afternoon, and is trying her very best at looking like the rest of the little undead ones. I have to say...she's pretty convincing! I may have to toss a little earth on her!! Happy Hauntings! When I walked into the studio this morning, I found Beatrice and Miss Pennythistle in heavy converstion about which hair color Beatrice should have. It was so intense even the fairys got in on it! Miss Pennythistle thinks one should always stand out in a crowd and be the center of attention! While Beatrice prefers the color of her hair to match the color of her eyes..a phantomly pale almost non existant blue. The ghostly little fairy thinks it should be something similar to her own pale locks, but I don't think either Miss pennythistle OR Beatrice could give a care what she thinks! Who do YOU think will win out?! 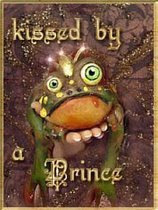 AAhh..Look what Miss Pennythistle found in my studio! A Disembodied Head! And not just any old disembodied head...but one belonging to a little Ghostie named Beatrice Baudelaire! I started Beatrice with a totally different idea in mind for her (a new type of ghostly being I wanted to try)...but she has a mind of her own, and decided she was to have a regular body like all the other little ghosties. And since she has creepy little teeth, I decided to give her what she wanted. She did manage to draw blood with a very sharp sculpting tool when I was creating her, so best not to mess with her! Desperately in need of some sort of skeletal structure I created one for her using armature wire. I strengthened her joints with plumbers apoxie...Love this stuff! Especially the Loctite brand. It's just like apoxie sculpt but it hardens in under 5 minutes....for instant gratification! Here Beatrice has her new legs and creepy little hands. Her little teeth don't show in the photo but they are there...all the better to gnaw on things with! In fact I'm not so sure it was the sculpting tool that drew the blood..maybe a tiny bite? Ouch! Miss Pennythistle (aka the roaming gnome) helps out holding her choice of hair for Beatrice...I dunno...I think Little Beatrice may have a say in this! "What happened to Humpty after the fall?.....His brains were scrambled and he couldn't recall"!! 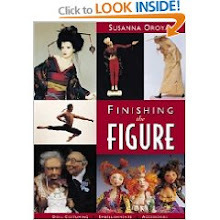 I'm doing a class at NIADA in 2009 in Arrowmount Tennessee, and thought since there is such a big interest at the moment in ball jointed dolls, that I would do a class on basic ball jointing. Since the class is only 2 days, and to do a full doll is really intensive, I thought a little ghostly Humpty would be the perfect victim to practice on! I sculpted this piece using La Doll, and air dry clay (or natural stone clay, as it states on the package) It comes from Japan, but is available here in the states. 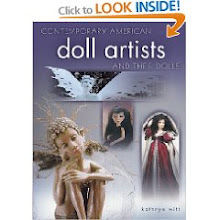 It is what alot of the japanese artists that make bjd's (ball jointed dolls) use. 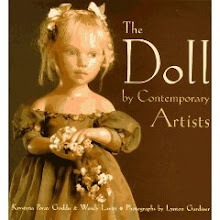 I picked La doll over using the polymer clays as I am finding that there are just to many strength issues..or lack of it..., with the amount of tension that the stringing puts on the polymer clay. Its not to bad if your just stringing arms and legs, but I find that to string the head along with the rest, results in too much tension, and therfore cracks in the clay where I had no Idea there was any weakness. 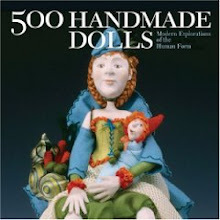 Doll Artist Sharon Dube, kindly suggested reinforcing the inside of the polymer with apoxie sculpt, which I think is a great idea, but haven't had a chance to try it yet. (These are the problems I have experienced, and may not reflect the results other artists have incountered.) If any one else has any ideas I would love to hear from you! Anyway, I think this is why the Japanese use the La Doll or Porcelian, or reproduce in resin. 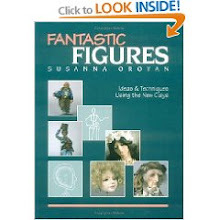 But, just doing a ooak (one of a kind) doll, I'm finding I have much better luck with the La Doll. The Japanese also use what they call "wood powder" which is like dry fine sawdust but has a glue in it, that activates when mixed with water.It's then mixed into the La Doll to strengthen it. I don't know why they don't import the wood powder along with the clay, but I've never been able to find it in the US and have had some of my kind Japanese artist friends send it to me. Okay..I'm rambling.... back to the class! By learning the ball jointing system in humptys legs it will give you enough information to be able to do arms also, as they are done the same way. Here is Humpty in progress, with the ever helpful Miss Pennythistle! Ghostly Good Mourning to all my SpOOktacular friends and Fellow Phantom Followers! My Friend and fellow artist Mo'a Romig Boyles, has included me on her wonderful Dia De Bloglandia Post! 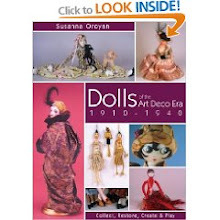 Check out her charming blog and wonderful creations! Also, A Tip of the Ghostly Top Hat and big Thank you, to the Heavenly Heather, for including my "Ghosties" in your incredibly creative blog.....check her out! (I hope I haven't left anyone out...Please send a kindly phantomly word if I've missed you, I try to keep up, but sometimes I find I've left my brains boiling a little to long in the cauldron)!! OoHHH..And not to Miss Adeles Spooky Art...It's SpOOkTacuLar!! Merci Miss SpOOky! AND... Last but Not Least... a SpOOkTacuLar "BIG THANK YOU" to all who Watch,... Follow,... comment,.... and are other wise lurking around dark and decrepit corners, peaking into my Dark Whimsical World...I know your there..you know who you are...!!! Come out..Come out.. Where Ever You Are..The Ghosties want to play!!! !